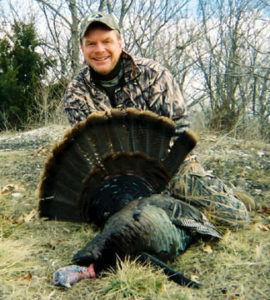 Fall turkey season for those who seek do it yourself hunts in Kansas, Missouri or Iowa. Mule Deer and fall turkey season are under used seasons we have within MAHA. In terms of fall turkey season it’s more a matter of executing fall deer scouting, early muzzleloader or archery or getting bird dogs ready rather than a dedicated fall turkey hunt alone. Or, tagging tom/jake/hen being incidental to another activity. Those who are dedicated fall turkey season hunter are less than 10. 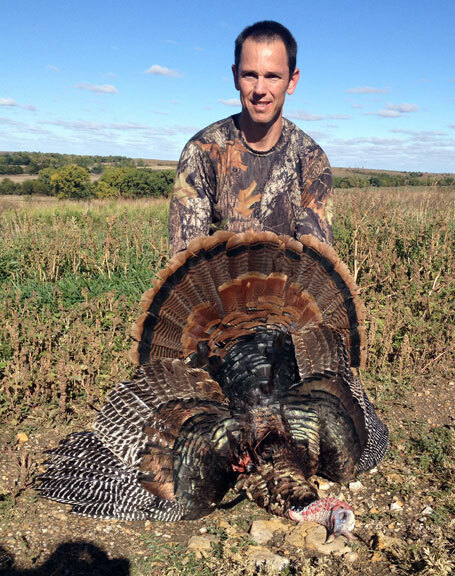 Kansas fall turkey season hunt plus pheasant, plus quail. They all have a long overlap. With pointing dogs. Kansas along with Iowa allows fall turkey season dog use. Do to commitments…pheasant hunting out west was out of question this weekend. However, with the KS turkey season running through January 31st….I’d thought I’d run out to [location deleted] and play with a few toms. A rather large bachelor group of toms strolled by at about 8:40 AM. They were about 75 yards out. I fired one shot into the ground at close range and the flock scattered just perfectly…to all clock positions and in small bunches. I waited patiently and 40 minutes later…I heard the first tom assembly yelp. I mimicked his yelps on a diaphragm and he began coming to me. In a matter of seconds I had 5 different toms responding from various directions. One tom was extremely vocal and closing the distance rather rapidly. I quickly pivoted 180 degrees on my set-up tree…assembly yelped. He came in on a run …clucked twice…purred…I clucked twice…purred…he appeared at 18 yards and I made the shot count between two small saplings. And believe me…these birds in the winter are just as much fun as in the spring. First saw this tom last spring. As you can see this bird is tremendous in size, but he had it all. 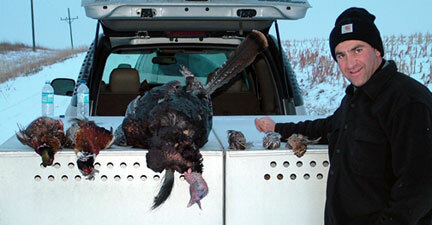 With matching 1 ¾” spurs and a 13 ½ “ beard…this bird scores over 90 points. A great end of the season memory to my second great year with MAHA!!! Fall turkey season also demonstrates a range of options available to MAHA hunters. Readers of this article may not be one yet. Now with its idea planted it is just time for many to give it a go. Through our one price for all seasons approach its easy to do. Or, perhaps a fall flock of yearling birds being easily approachable as they are simply are not a challenge. Compared to spring toms. Or, allure of an easy fall hunt may initially seem appealing to all too difficult spring season tom that fails in attraction to our best and sexiest hen calls. That challenge alone brings with it a special satisfaction not attainable during the fall season. Plus timing of fall turkey season overlapping with deer. Some feel spring turkey season is when not much else to do except to put in a garden or ready the lawn mower. When facing those two alternatives a spring turkey hunt does seem all the better. What we show is there is choice. Hunters’ choice. MAHA gives resource to having choice. Kansas and Missouri offer easy to buy over the counter tags for archery or shotgun fall turkey season. Kansas is more liberal than well known turkey hunting state of Missouri. Fall season in each is certainly long enough (shortest is 31 days long) allowing easy vacation planning. Especially, on a combination late fall deer scouting or stand hanging trip to be conducted with shotgun in hand should happenstance of coming across a flock. Happenstance being preparation meeting opportunity. MAHA provides for opportunity. Certainly easy enough to put the shotgun in truck as a very least preparation. Tony, his first fall turkey season. Those with children there does arise fall turkey season overlaps with youth deer season making a trip doubly beneficial. 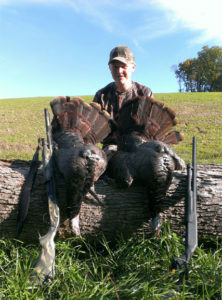 What a weekend it would be for a youth to harvest both a deer plus turkey be it jake or hen. Who would care when it comes to a youth trophy! With dad harvesting a bird as well would make a grand picture surely to adorn a wall giving a lifetime of memories of one special trip. Should it be no tag is filled it cannot be argued a trip without game may be anything less than had all tags been filled. After all spirit of the hunt itself, not birds. Wildlife only becomes a necessity of purpose. Not that any harvest are where true memories come to last. Reggie with dad both tag. Only point to be made within this article is with MAHA, having many seasons, there is not any reason for self guided hunters to stay home. Spring or fall turkey season is available to all that want to hunt.